Now, here is a face-to-face fight between a Minecraft character and a creeper at each stage. By destroying blocks, the creeper will be fallen into lava. 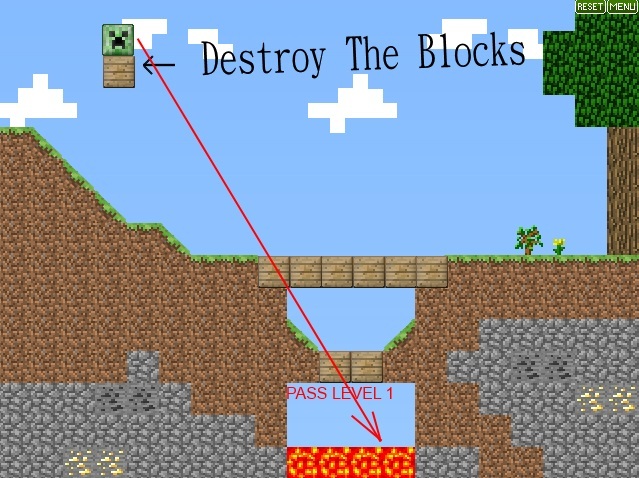 The key of this game is that you must calculate which blocks should be destroyed first and which ones will be done later so that force is strong enough to push the creeper into lava. Differently previous times, later times players cannot see where lava is, so you may spend some time exploring the location of lava and searching ways to access it fastest. Furthermore, if you fail to recognize place of lava at a certain level, pressing Reset on the top of the screen brings you back that level. Pressing Menu will bring you back to the beginning of the game. Similarly to unknown place of lava, some surprising things are in need of your discovery. It is hard to say how many times you will accomplish Kill The Creeper, so let it be a question waiting for your answer. Let see how many creepers you have knocked out, and share with us your achievements! Hope that you have relaxing moments with Kill the Creeper! – Kill the Creeper is play with the mouse.